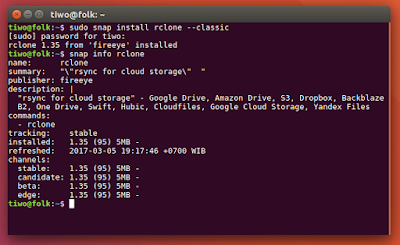 Install Rclone Snap - Rclone is a command line tool for synchronizing files and folders to multiple cloud storages. It supports Dropbox, Google Drive, Amazon S3, Amazon Drive, Microsoft One Drive, Openstack Swift / Rackspace cloud files / Memset Memstore, Yandex Disk, and many more. This tool is useful for backup purposes. Rclone is now available as a snap package, meaning you can now install or update Rclone easily on a wide range of Linux distribution which support Snaps such as Ubuntu, Debian, Fedora, Gentoo, Arch Linux, OpenSuse, etc. All the rclone commands (eg sync, copy etc) will work on all the remote storage systems. The good things, Rclone is free software under the terms of MIT the license. You need a snapd package. However, it should be installed by the default in Ubuntu 16.04 LTS Xenial Xerus, 16.10 Yakkety Yak, 17.04 Zesty Zapus. 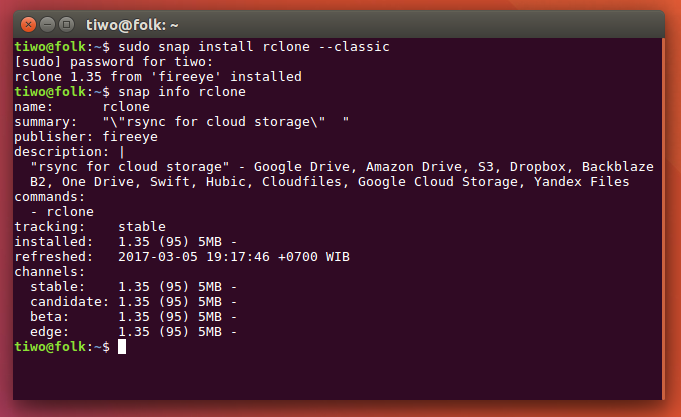 For other Linux distributions, installing snapd is detailed on the Rclone GitHub installation page. If you need a development version, simply use rclone-dev instead. The source code can be found on its GitHub. That's all folks! Thanks for visiting us.